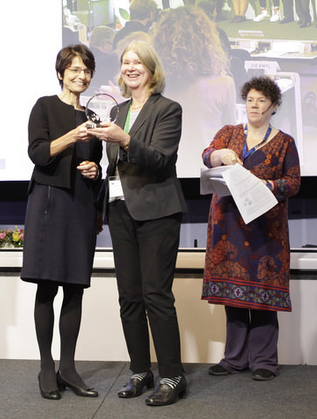 Congratulations to Karen Evans, winner of the 2017 European Vocational Education and Training Research Award. Well deserved! Research of Machiel Bouwmans et al on distributed leadership in VET schools is accepted for publication in the journal Educational Management Administration & Leadership. The paper focuses on the interplay between formal leaders and team members. Once the paper is published it will be announced here. Full reference: Bouwmans, M., Runhaar, P., Wesselink, R., & Mulder, M. (Accepted 10 November 2017). Towards distributed leadership in VET schools: the interplay between formal leaders and team members. Educational Management Administration & Leadership. Research of Judith Gulikers et al on assessment innovation is published online. An action research was conducted with 34 teacher teams of 11 pre-Vocational Education and Training institutions, to implement a new (competence-based) assessment. The results, based on data from 76 teachers, 68 students, 24 teacher coaches and 3 researchers, show (as expected) that the new assessment implies changes in curriculum and teaching to align these with the competence-based education philosophy in action. Various challenges emerged from this research: how to increase teachers’ expectations of student performance, how to change student-teacher interaction patterns, how to develop teachers’ practical understanding of the competencies which are being taught, and how to observe and discuss student performance during assessments, all as a consequence of competence-based student assessment. The full reference is: Gulikers, J.T.M., Runhaar, P. & Mulder, M. (2017): An assessment innovation as flywheel for changing teaching and learning, Journal of Vocational Education & Training, DOI: 10.1080/13636820.2017.1394353. Not new, but I just read that in the United States’ Carl D. Perkins Career and Technical Education Improvement Act of 2006 on page S. 250—4, Career and Technical Education is defined as including competency-based applied learning. For the worldwide discussion about the competence-based education philosophy, this is quite relevant. Competency-based applied learning in this Act does not refer to basis skills or laundry lists of functional knowledge, but to the acquisition of academic knowledge, higher-order reasoning and problem-solving skills, work attitudes and knowledge about the world of work, including entrepreneurship. That’s quite different from what critics of the competence-based education philosophy attribute to this concept. I have often referred to the Competence Framework of the Medical Profession (CanMeds) as an example of a content-related competence framework. Today I noticed that there is an Engineering Competency Framework as well, which is published by the American Association of Engineering Societies and the United States Department of Labor in 2015. The model can be found via this link: www.aaes.org/model. In this time of increased attention for STEM, Industry 4.0 and Future-oriented competence, this model may be useful. My successor as chair holder of the Education and Competence Studies group at Wageningen University, Prof. dr. Perry den Brok, started on October 1. I am happy for him that he assumes his role at a moment in time at which Wageningen University and Research is sky-rocketing. Research and education of the organization are top-notch, and its world-leading reputation is signified by the article ‘This Tiny Country Feeds the World’, in the September-issue of the National Geographic (http://www.nationalgeographic.com/magazine/2017/09/holland-agriculture-sustainable-farming/). Although more critical authors would have told another story about Dutch agriculture, it is true that the Netherlands is a miracle of agricultural productivity. This miracle is attributed by many to the strong knowledge system in the agrifood sector in which the government, the industry, and the knowledge institutes closely cooperate. Called the ‘golden triangle’, agricultural education at all levels, plays an essential role. Without effective education and learning, there would be no such thing as responsible precision agriculture and knowledge farming. The Executive Board of the University has decided to name the chair of Perry ‘Education and Learning Sciences’, and the chair group will get the same name in due course. Perry was director of the Eindhoven School of Education at Eindhoven University of Technology. ECS has posted the following about Perry on its website: ‘During the past years, Perry has been involved in research on learning environments (from primary to higher and vocational education), teacher professional development and teacher learning, and research on Science, Technology, Engineering and Mathematics (e.g. STEM) education. He has also acted as teacher educator, educational consultant, and promotor of various PhD students. Two external PhD students, Hanneke Theelen (Fontys University of Applied Science) and Robert Ovbiagbonhia (Hanze University of Applied Science), will also become part of ECS research (and two more candidates are in progress). Perry is currently editor of the Learning Environments Research journal, and has been active as chair or board member of several organizations, such as the Dutch Educational Research Association (treasurer, chair of the SIG Teaching and Teacher Education), the SIG Learning Environments of AERA, and EARLI. He has published extensively, more information in this respect can be found at his personal webpage at TU/e (URL: https://www.tue.nl/en/university/about-the-university/eindhoven-school-of-education/about-esoe/staff/detail/ep/e/d/ep-uid/20070578/ep-tab/4/ ) and at Google Scholar (URL: https://scholar.google.nl/citations?user=OU2D-5AAAAAJ&hl=en ). For me, Perry is also not new. I got to know him from my various international activities. I believe Wageningen University has found an excellent successor for me, I congratulate the search committee, and I wish Perry and the staff of the group lots of success. I am confident that with the new chair the group will reach new heights. The manuscript of Judith Gulikers et al on assessment innovation is accepted for publication in the Journal of Vocational Education and Training. The article points at the importance of innovating assessment practice as a katalyst for changing teaching and learning practice. The article is now in production and will be available soon.